If you are a supervisor, a postgraduate researcher or into research in one way or another, then this website may be of interest. It helps you find a participant for your research, whether it is a survey, interview or something else. The website is entitled ‘Call for Participants’. It’s been developed by students at Nottingham University and was supported by the JISC Summer of Innovation programme. The live website will soon superseded by a more improved version which can be customisable to institutions or departments. So for instance, if you are a Psychology department at University X, you will be able to design your own landing page, listing all your current research projects’ “Call for participants” area. This site may also be useful if you just want to have a quick view on the current research going on in your field. The departmental and institutional customisation is a new offering and is currently being piloted. Matt Terrell who presented this project at the JISC learning and teaching experts forum, asked if any institutions are interested in piloting these new features. It is currently free, so why not try it out? If you are interested in hearing about university related developments in technology enhanced learning, please subscribe to our University of Liverpool eLearning Unit blog (bottom right). researching the learner experience and technology? in learner experience research within a collegial setting. Come and find out more at our inaugural event. Speakers include Dr Paul Ashwin, University of Lancaster. 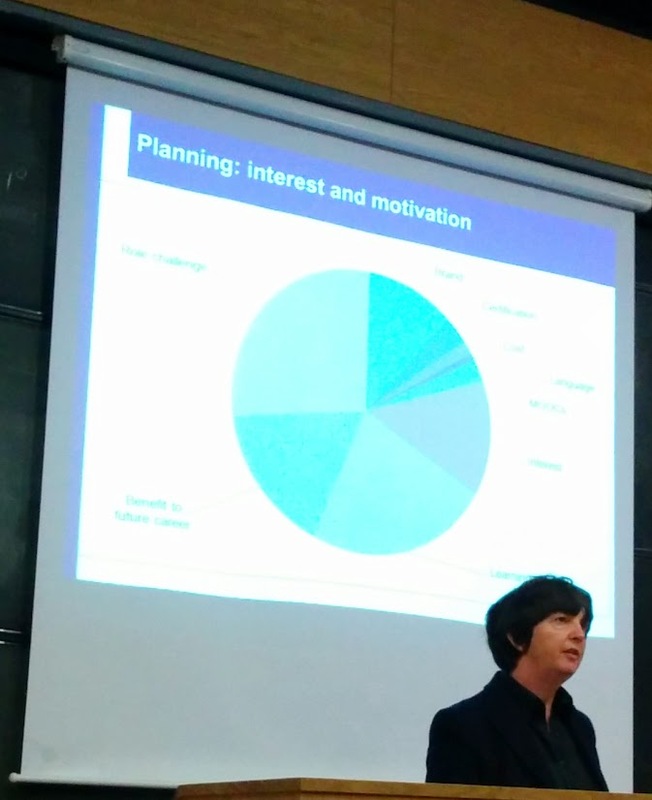 develop your own idea and turn it into an action plan for research. Full programme details: ELESIG North West Symposium flyer. 3 words: Congratulations, Dr Prescott! This is a big congratulatory blog post to our Head of the eLearning Unit, Dr Debbie Prescott, who successfully defended her thesis on “Influential factors in the adoption and implementation of educational technology at the University of Liverpool“ on Monday 28th Oct 2013, graduating from Lancaster University’s Doctoral Programme in E-Research and Technology Enhanced Learning. Debbie was supervised by Dr Gale Parchoma and her examiners were Prof Mark Stiles and Dr Julie-Ann Sime. 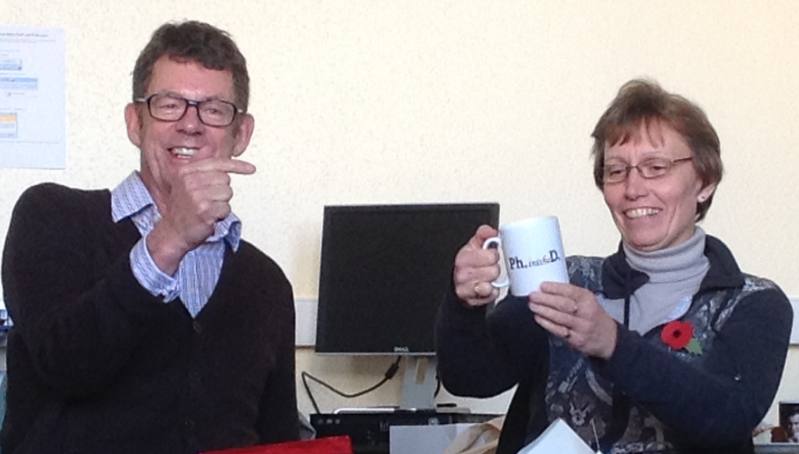 Educational Development and eLearning Unit congratulate Dr Debbie Prescott on getting Ph.inishe.D. Well done, can’t help but say it again, Doctor Prescott, from all of us at eLU and Eddev! How to run a webinar? We have Followed the Sun…. The video recording above is of our second, really successful webinar on using the Nominal Group Technique that we ran at the wholly online Follow the Sun conference in March 2012, hosted by Leicester in the UK as well as Australia and the US. 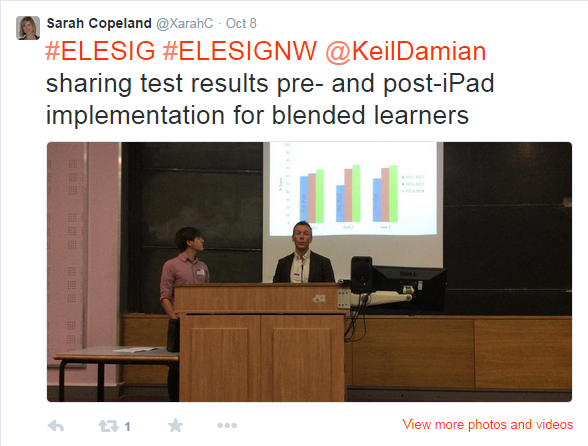 (Our first session for the ELESIG group was summarised by one of the participants, Olivia Fox, in her blog.) This blog summarises our experiences and tips for running a webinar, in case you are thinking of trying it out. So what is a webinar? A webinar = web-based seminar. It has all the elements of the face-to-face seminar but it is running completely online, with participants logging on at a distance, and is usually conducted through a web-conferencing platform, like Blackboard Collaborate (nee Elluminate) or Adobe Connect. Webinars can also be recorded for reviewing, or for those who miss the session. Our first session, back in Feb 2012, was facilitated by the ELESIG committee members, Helen Whitehead and Carol Higgison, who spent two occasions with our four-member team to help us get to know the software, Blackboard Collaborate, and its features and layout so that we could plan the interactivity used in the session. We were quite ambitious in that we not only delivered the one-hour session with four presenters (where you normally only have one or two), but we also planned to run a real Nominal Group Technique session online. 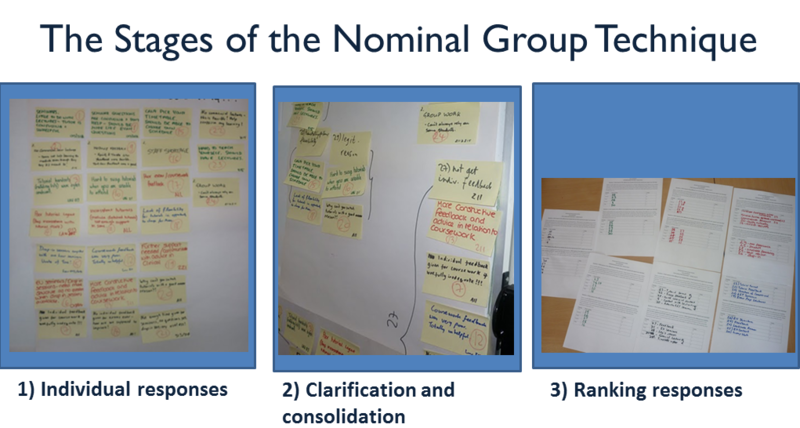 The Nominal Group Technique is a useful student evaluation technique of learning experiences. Our focus was on evaluation for the purpose of curriculum design or review. We had set ourselves the task of finding an online way to mimic the ‘real world’ process of people writing ideas on post-it notes, then clarifying and consolidating the different post-it-note items and then finally ranking them, as in the pictures to the right. We devised a system where participants wrote their entries on a virtual whiteboard, then one of our team organised them as we were clarifying, by grouping the same items together, and then the voting stage was simulated by drawing circles next to the vote items (the above video is of our second session which was shorter and did not include this step). The process was a bit clunky but it worked as it did get the idea of each of the stages of the Nominal Group Technique across to the participants. We also made use of other interactive features such as polling. Participants followed the webinar using their headphones, and asked questions using the chat text entry box as we went along. So it was good fun and we were very happy with the interactions during the session. Finally, we just wanted to share some of the tips we have learnt about running webinars. What do you need for running a webinar? A web-conferencing system e.g. Blackboard Collaborate. At the University of Liverpool we currently have Adobe Connect available for web-conferencing. Headphones and microphone for each team member. Powerpoint slides (optional) or other resources. So what did we learn about conducting a webinar? Don’t use speakers, use headphones, as speakers may echo. Show video or not to show (of presenters)? Advice here can be event-specific; some say it looks more professional if you don’t show video, just sound; others like showing video. We used screenshots of ourselves on the slides. Use of smiley icons or hands up for questions, or quick yes/no button to clarify e.g. if participants hear or understood something. Ask participants’ prior experiences as a quick poll (see about 8 mins in the above video). Moderator: one of their roles is to welcome participants, and ensure all is working with their audio. Practice practice practice – especially the interactive bits! And timings. Switch sound off if you are not presenting. Think about how to manage silence (when participants are engaged in a task or waiting for responses). Someone needs to monitor chat. Lack of non-verbal cues: keep having slots for questions, clarification + at the end – ask about how they may use it in their practice? Ask some experienced colleagues, if available, to run it with you to practise and offer feedback about session interactivity. Be brave. Have a go! ps: If you have experience of running or participating in/attending a webinar before, please share your tips and reflections in the comment box below. Practical Guide ( http://slidesha.re/AmYOgv ).